We’re glad you’re here! Below you’ll find Jenny Munn’s presentation from her session, Search Engine Optimization for 2015—What’s In? What’s Out?, along with other invaluable resources that can help you in your journey to SEO success for your business. Have questions or need help with your SEO strategy? We’re here to help! Click here to learn more about the services our consultancy has to offer. Don’t miss the special offer from Jenny just for EdNet attendees at the bottom of this page! Click the image below to download a copy of Jenny’s presentation: Search Engine Optimization for 2015—What’s In? What’s Out? Keep up with all the SEO changes, updates, and the most important news can be overwhelming! We’ve got you covered with our non-boring SEO newsletter. Our founder and top SEO strategist Jenny Munn LOVES to keep up with SEO news and share the latest and greatest with you. Want in? Register using the form below to get access to her SEO news twice a month. If you are a busy marketing professional looking to gain more qualified leads using organic SEO, but you need a little help getting started, we’ve got you covered. If you are ready to get serious about driving more targeted traffic to your site, check out our SEO Essentials report: How to Get More Leads – A Checklist of 8 Essentials for Busy Marketers in Growing Businesses. Want to learn more about DIY SEO and how to conduct keyword research? 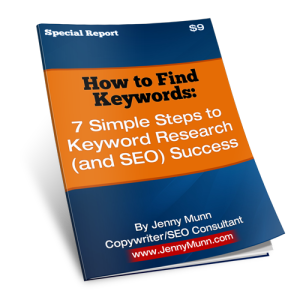 Then you need Jenny’s keyword research guide, How to Find Keywords: 7 Simple Steps to Keyword Research (and SEO) Success. Download your copy for free today! Do you (or your clients) have a WordPress site for business? Jenny is a frequent speaker at WordCamp, an international conference organization focused on using WordPress for business. Check out some of her talks about SEO specifically for WordPress sites here. Content Marketing Institute’s 2016 B2B Content Marketing report was recently released; check out some of their key findings here. For the full report, click the image below. Marketo’s Website and SEO for Lead Generation ebook is an excellent free resource all about using the power of SEO combined with your website to increase qualified lead generation for your business. See the full ebook by clicking on the image below. Looking for SEO guidance or direction? about our services or check out some common FAQs on how we work. Let’s set up a time to chat – feel free to grab a spot on my online calendar today: https://www.timetrade.com/book/ZBHLN.